The Multipure Aquaversa for Inline is a highly effective drinking water filtration system that installs inline and provides convenient access to fresh, clean drinking water whenever you want it. The Aquaversa for Inline is designed to be installed below counter and used for inline applications such as for icemakers, hot water dispensers, water fountains, coffee machines, various restaurant uses, and more. The versatile filtration unit housing can be mounted out of sight on the cabinet wall, or set on the cabinet floor using an optional plastic base (not included), and it ships to you with a mounting bracket for attaching the housing to a cabinet wall. The Aquaversa uses Multipure’s unique solid carbon block filter technology, which is considered to be the most effective method for reducing a wide range of contaminants of health concern that may be present in your local water. The carbon is compacted into a dense structure, causing every molecule of water to be forced through microscopic pores of carbon, effectively reducing pollutants. The solid carbon block water filter is a replaceable cartridge designed so that it may be easily changed. The solid carbon block water filter does not waste water, there is no electricity required, it does not remove essential trace minerals that are beneficial to good health, it does not add salt or silver to the water, and it provides fresh, delicious, healthy drinking water. You can trust that the Aquaversa will perform as advertised because the Aquaversa is tested and certified by NSF International against stringent performance standards. 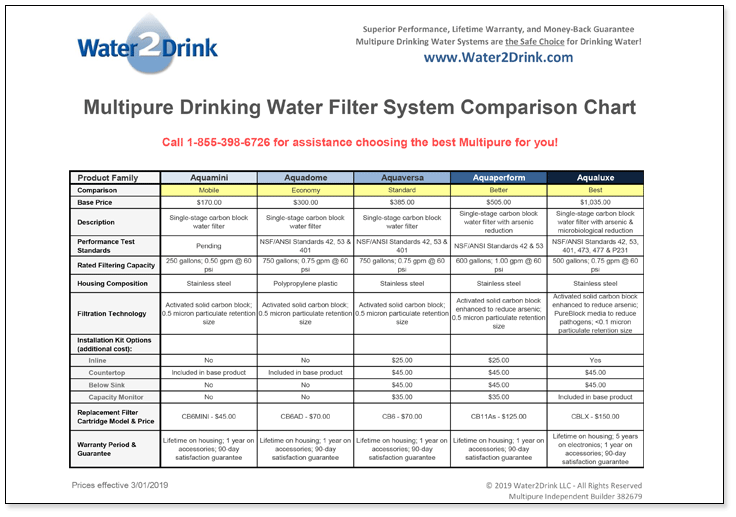 This filter system previously was identified as Multipure model MP750SI. This product does not ship with any connectors, hoses, shutoff valves or faucet. If needed, these items must be separately ordered. Weight (basic unit) 5.0 lbs.